Can all the demons be exorcised in three minutes, 43 seconds? Can all the nights when UNLV’s basketball team wasn’t tough or resilient enough disappear in that short amount of time? For now, for today, definitely. SAN DIEGO – Can all the demons be exorcised in three minutes, 43 seconds? Can all the nights when UNLV’s basketball team wasn’t tough or resilient enough disappear in that short amount of time? For now, for today, definitely. It’s not just one win. Coaches say it but know better. In beating 15th-ranked San Diego State by an 82-75 final at a typically raucous Viejas Arena on Wednesday night, the Rebels cleared a barrier that has impeded their growth as a program as sure as Johnny (Heath Schroyer) Vegas favors open-collared dress shirts. 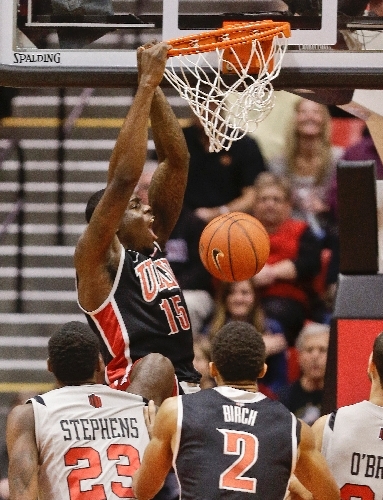 UNLV was tougher when it mattered most, making plays that not only win games in January, but most always during March. The Rebels deserved to win in every way and did so in what might seem the most surprising of ways. In the mind of a coach, it is a simple strategic move. It’s not any bigger deal than matching your opposition. But in the big picture of a team beginning to believe in itself and creating a more rugged stature, what happened with UNLV late in Wednesday’s game could pay dividends for some time. The Rebels went small down the stretch to match San Diego State’s lineup of five guards, putting Anthony Bennett and Mike Moser on the bench and having 6-foot-3-inch senior guard Justin Hawkins play the power forward. UNLV’s bigs couldn’t defend the Aztecs all evening, meaning that with 26 NBA personnel members from 19 teams in attendance to primarily watch Bennett, the team’s best player became a spectator at the most crucial time. It ultimately won UNLV the game. "Coach (Dave) Rice made a great adjustment," said UNLV associate head coach Justin Hutson, who led the scouting for this game. "We have a lot of good players on this team. Any time you get a win against the 15th-ranked team in the country at their place and in this environment, it’s always good news and helps us. Makes us feel good. Gives us confidence. A building block to build on." Hutson knows the Aztecs better than anyone, having coached at San Diego State and recruited many of their leading players. He said the keys to winning were limiting San Diego State’s 3-pointers (the Aztecs were 3-for-19) and points in transition. Those were the keys beforehand. The game was tied at 73 with 3:43 remaining, after which UNLV closed out its win with three offensive rebounds (two by Khem Birch and one by Hawkins) that led to six points, making the sort of hustle and tough plays that New Mexico did last week in beating the Rebels. The game ended with nine guards and Birch on the floor. 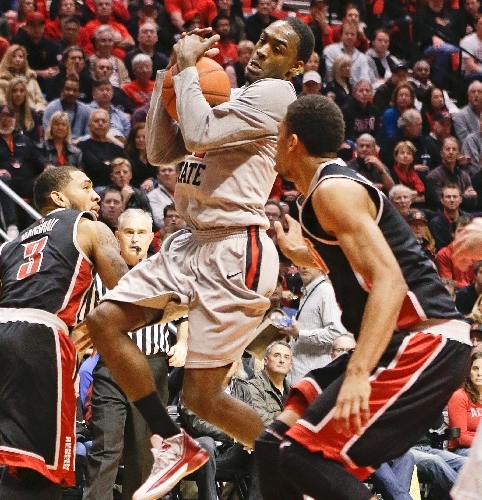 "UNLV never surprises me," San Diego State guard Jamaal Franklin said. "I’ve played against them too many times. I knew they would play well and fast. I knew they would have the adrenaline pumping. You know what they’re going to bring." Said Aztecs guard Chase Tapley: "Basically, they punked us." This was one of those times where Rice could say afterward that it had been a great college basketball game and no one would blink. He says that a lot. People blink a lot. But as his players mature, so too does a second-year coach – "Dave Rice is doing a terrific job," Hutson said afterward – whose team’s lack of toughness has caused many to wonder if it had adopted too much of their leader’s measured demeanor. I don’t know how much truth there is to it, but I know San Diego State has only lost five of its past 63 home games and Rice has been involved in three (twice as the associate head coach at Brigham Young and Wednesday night). "This is a great team win for us," Rice said. "I was asked on a (Mountain West) conference call this week by a reporter about all the close (road) games we have lost, and it’s true. Since our staff has been intact, every game has been close and it was about time we won one." Colorado State, a beast of a team at home, is next for UNLV on Saturday in Fort Collins. It’s a load of a game coming so soon after such an emotional victory. For now, for today, the demons are exorcised. Rice, his staff and players deserve a few hours to savor this one. Las Vegas Review-Journal sports columnist Ed Graney can be reached at egraney@reviewjournal.com or 702-383-4618. He can be heard from 11 a.m. to 2 p.m. Monday through Friday on "Gridlock," ESPN 1100 and 98.9 FM. Follow him on Twitter: @edgraney.